Superb Owl creation Sonia, such clever use of colour and papers. 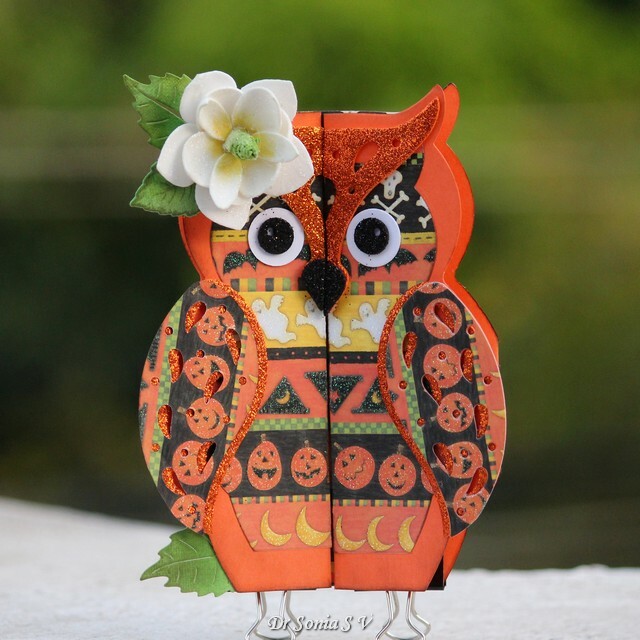 I love this gorgeous Halloween themed Owl Sonia. He's fabulous and the colours are wonderful too. Love love love love this! The papers are PERFECT!!!!!!!! Halloween does not have to be scary. Your Owl is wonderful. The papers used are good Halloween themed. Your owl is fabulous Sonia, great papers. Wow this is absolutely amazing ! You cannot pass up on cute Sonia...gorgeous Owl card, wonderful. I always LOVE your BEAUTIFUL owl shaped cards, Sonia. They are so inspiring! Kisses, my friend. Cute owl card, also a bit spooky LOL :D Love all the glitter! WOW!! This is so BEAUTIFUL!! I love it Sonia! What a SPOOKY CUTE Owl!!! I think it's adorable Sonja! Fun Project! I say this is fantastic! I love how you've really glammed up your owl. While an owl is a traditional Halloween bird, you've given it a whole new look with all of those wonderful details. Thank you so much for your continued support of our Simon Says Stamp Monday Challenges! Wonderful card,Sonia. Love the shape. Your owls is so tweet. I love her to bits. Hugs Mrs A.
Sonia, this is the only way I would ever do Halloween... too cute to spook! Your owl is darling, made even lovelier in that it's a shaped card! Oh how I adore those. Your paper choices are fantastic. I have dearly missed you (and your inspiring creations). Your posts are a blessing and I am elated to be back in the crafty community. Thank you for never giving up on me! :) Have a wonderful weekend, my friend! Oh my goodness, Sonia - this is incredible! What a pretty, sparkly owl - love it!!! Hope you're doing well. Sorry I've been MIA - still trying to get over my June illness. I'll try to do better! Your owl is so sweet! You chose fun papers and love the orange sparkle! What an amazing card. Love ALL the details and papers you used to create this beautiful owl. I have this die and haven't made him in a long time, but might just have to pull him out and give him a go. you have inspired me!! A Christmas Owl perhaps! Coming again to tell you a goodmorning, Sonia. Kisses, my friend.